This towel is amazing! This salon favorite is designed to be bleach resistant, stain resistant and super absorbent. 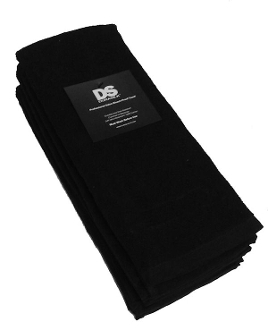 Our special DuraColour™ technology makes this towel hold is black color wash after wash. This towel really performs in the harsh demands of the salon environment, wash after wash. Super absorbent 100% cotton wicks water from hair quickly for less dry time. Invest in this superb quality towel so that it will perform longer and save your salon money. Oeko Tex 100 certified. Sold in 3 Pack only.